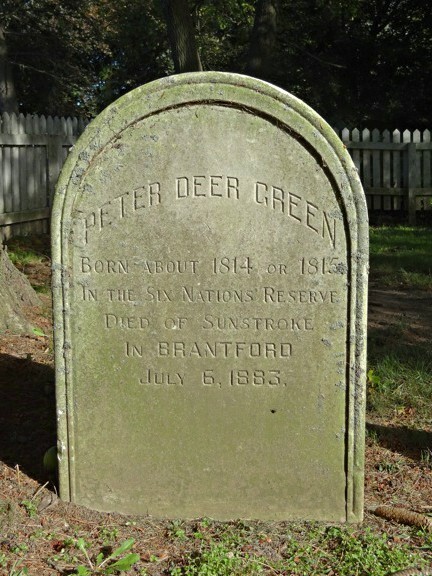 Peter Deer died of sunstroke. and lies in the Mohawk Chapel Burying Ground. Nothing more is known about his life. sun - or heat - stroke is still not such a rare thing to die of. even though I could not find out if he was related to any of the other Greens in the cemetery, that tiny bit of information about his death makes him a little less anonymous, somehow. Love these glimpses into the past. I've been neglecting my cemetery visits for too long. now that I've made a few trips I'm remembering how much I enjoy the sightings and the research. How very interesting. I really enjoyed your post. Hope things cool down for you! thank you. and no, it is due to get warmer! No one left who knows who Peter Green was. That's is too bad. He should have taken water with him. It could certainly happen to someone today! thanks. glad you dropped by. Very historical. I love reading about stories like this. and the plaque is in several languages. sorry it's a bit hard to read. The plaque information is so interesting. 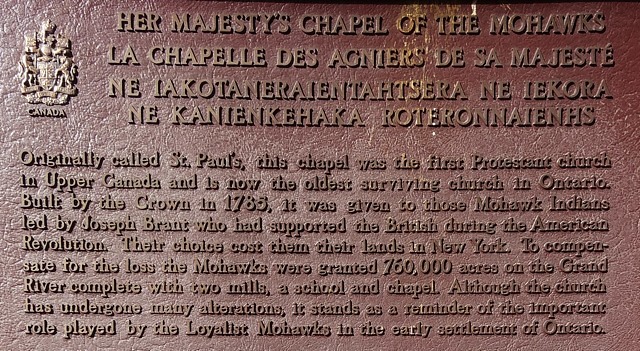 I had no idea about the Mohawk Indians supporting the British. It seems to strange that these people would be gifted a chapel. Would it be used? 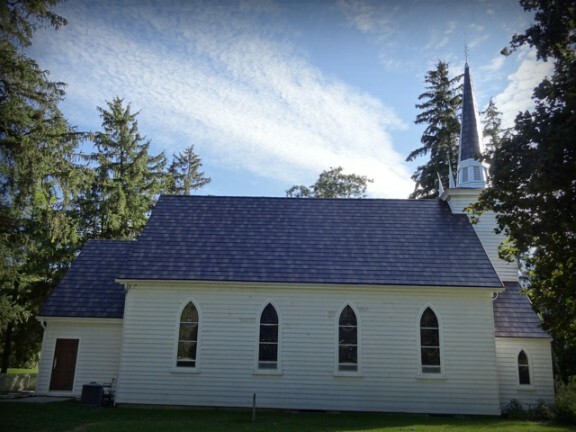 Yes, it is still used every Sunday for services. And is open to the public for tours during the summer. Three little words that make Mr Green more than a statistic. So much easier to imagine his life and death with that addition. At least we know something about him - besides dates - even if it is only how he died. I believe there have been a few people here hospitalized with sunstroke during this heatwave. Haven't heard of anyone dying, yet. We have more opportunities to escape the heat in this century. He was in his mid 60s, so may have been hard at work. and yes, had nowhere to escape the heat. 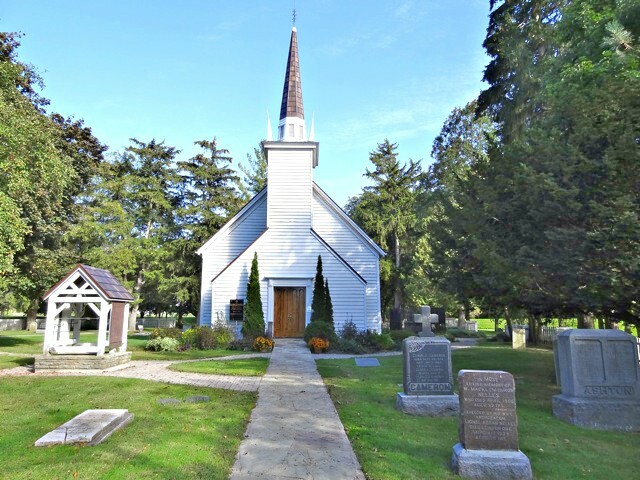 Lovely little church! It's interesting that they put the cause of death on his tombstone. Every now and then you'll see that, but it is rare. Usually, it might be because the death was of a particularly newsworthy event - a fire or train accident for instance. Apropo the green color; It seems to me that the material and color most appropriate for headstones is Hebron marble which is white or off-white. There's something very spiritual about that material and color. The problem is that Hebron (place near Jerusalem) marble is not resilient to climate's harms. I had heard of this church but now thanks to you, I have the chance to see it. Where exactly is it? Near any large towns? The church doesn't look that ancient form the picture. Thanks for sharing. It is in Brantford, about a 40kms or so from Hamilton. And I guess it has been refurbished many times. It's also a popular spot for weddings, so would need to be well kept.